AnonOrange, a member of Anonymous from Orange County, California, a.k.a. 52-year-old Francois, was arrested on October 26, 2008 for trespassing on Scientology church property. He was arrested by local Church security guards. It looks like he also assaulted one of the security guards, whose hand was being bandaged up. This comes just two days after his buddy “AngryGayPope” a.k.a. Donald Myers was served with his 3-year Restraining Order for harassing and following a Church staff member in Hollywood. 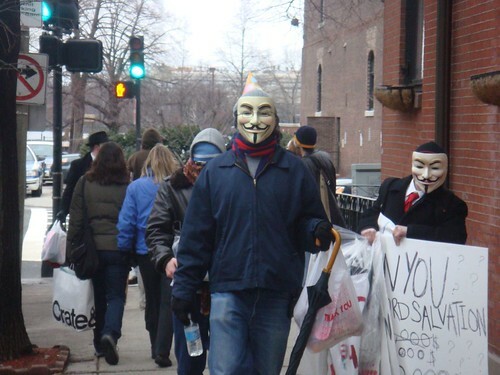 Short News is running an article about Massachusetts-based Anonymous organizer Gregg Housh. He pled at the Boston Municipal Court last Wednesday to stay away from the Church of Scientology after agreeing that the facts alleged against him were true. These facts include harassment, disturbing the peace and disturbing religious worship. The agreement, called a “Continuance without a Finding” and sealed by the judge for one year, was welcomed by both parties. Should Housh violate the agreement he faces one year in prison. Housh was the one who also led a group of masked Anonymous members into the Boston Scientology church in March, which the Church considered to be trespassing and harassment. A Boston Municipal Court judge today continued for one year the case against a Woburn man alleged to have disturbed proceedings at the Back Bay Church of Scientology earlier this year, and will dismiss the case if the defendant abides by certain conditions during that time. Judge Thomas C. Horgan imposed a one-year continuance without a finding in the case against GREGG HOUSH (D.O.B. 10/17/76), who had been charged with disturbing an assembly of worship and disturbing the peace. If Housh stays away from the Back Bay headquarters of the Church of Scientology and its expected new headquarters in Boston’s South End, and if he does not re-offend in any other manner, those charges will be dismissed. If he does not abide by those terms, Housh’s case could be put back on track for trial. Also in today’s proceedings, Suffolk prosecutors affirmatively moved to dismiss an additional charge of criminal harassment against Housh. After a review of the evidence, prosecutors determined they could not meet their burden of proof beyond a reasonable doubt on this charge and could not in good faith move forward with it. Had the case gone to trial, prosecutors would have introduced evidence and testimony to show that Housh and others entered the Church of Scientology’s Beacon Street building in a boisterous manner during a March 1 protest, disturbing the proceedings and alarming those inside. Attorney Michael Dlott represented Housh. You are currently browsing the archives for the harassment category.